A revised edition of the OCHIN Epic Colorectal Cancer Screening Improvement Guide is now available on Ella, OCHIN’s LMS. A username and password is required to log in. Contact your Site Specialist for access. Scroll to the red PDF icon at the bottom of the page to open the guide. Educational materials, such as webinars and videos, are posted alongside each improvement guide. 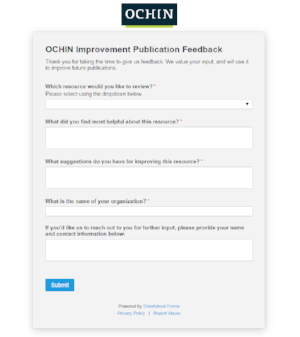 Brought to you by the HCCN Award, this comprehensive resource includes valuable information about ways to use OCHIN tools, reports, dashboards, and workflows to sustainably achieve reporting thresholds and improve the quality of patient care. The Guide also features information about the U.S. Preventive Services Task Force (USPSTF) and American College of Gastroenterology guidelines and resources. All improvement guides contain a chapter on principles of change management and templates to help members implement change ideas to meet the needs of their clinic. Of note are a robust suite of OCHIN Epic Reporting Workbench reports adopted from the STOP-CRC study, Health Maintenance features, and Business Objects reports to help members successfully meet UDS reporting requirements. The diversity of OCHIN clinics across the nation range from the rural frontier to the inner city, and their stories make for fascinating reading. In these case studies, members share personal experiences, discoveries, and processes they developed and refined in the clinic, that improved the quality of healthcare for the vulnerable populations OCHIN serves. Two of the case studies featured in the Guide were contributed by Ariana Andrade, clinical quality manager at Clínica Monseñor Oscar A. Romero in Los Angeles, California, and Meg Bowen, quality director at Winding Waters Community Health Center in Enterprise Oregon. Andrade discusses how Clínica Romero successfully integrated lay patient navigators into its colorectal cancer screening program to scrub charts, check patient eligibility, mail FIT kits, and conduct patient outreach and education to raise the rate of FIT kit completion. Bowen shares the many ways Winding Water’s Quality Improvement Academy helped her clinic achieve the number one ranking across the entire OCHIN collaborative on this clinical quality measure. These case studies are also posted in the new OCHIN Epic Case Study Collection on Ella. There is a link to a short survey embedded in the new OCHIN Epic Colorectal Cancer Screening Improvement Guide and the OCHIN Epic Cervical Cancer Screening and Prevention Improvement Guide published earlier this year. You can also click here to access the survey. Select the appropriate guide from the dropdown menu. Please tell us what you like about the guides, and what could be improved. For information about OCHIN’s quality improvement publications, please contact Erica Edwards at edwardse@ochin.org.